This beautiful, quiet beach is an ideal spot for a small, intimate wedding ceremony, and has become hugely popular with brides and grooms over the last couple of years. Your wedding ceremony is held directly on the golden sandy beach, which is located in the village of Sotira, just outside the Nissi Bay area of Ayia Napa. Sotira is one of the largest coastal towns in the area and its coastline reaches over 2 kilometres of perfect sandy beaches and clear blue sea. 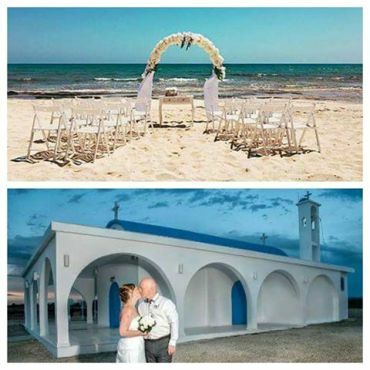 Also situated close by, is the iconic Ayia Thekla Chapel which is very popular amongst photographers and wedding couples alike, to capture some magical wedding shots. There are a couple of restaurants close by, which would be the ideal place to hold your wedding reception. First is the Nissaki Restaurant, situated only a few metres away, and who, opens their roof terrace exclusively for you and your guests to have privacy from other diners, and, enjoy the most breathtaking view. There is also the Dione Restaurant, situated very close to the ceremony area. This has a children’s play area to the back of the restaurant, and, they will look after you, like you are one of their own family.